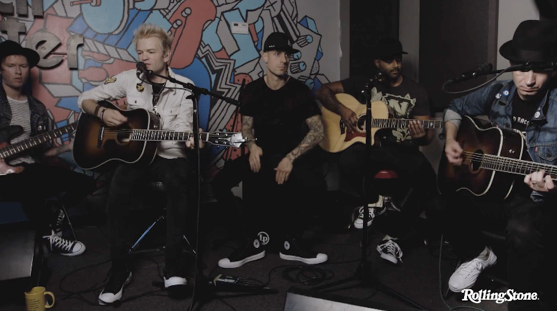 Of "War", "Fake My Own Death", and "Hell Song"
November 1st, 2016 - Los Angeles, CA - In addition to Sum 41 being featured in the latest issue of Rolling Stone, the band spent some time performing three acoustic songs exclusively for RollingStone.com, that have just gone live. The stripped down set features two new songs off 13 Voices, "War" and "Fake My Own Death" and a throwback from their 2002 sophomore album, Does This Look Infected, with "Hell Song." Rolling Stone journalist Brittany Spanos said, "The acoustic run-through unlocks the vulnerability singer Deryck Whibley puts forth in his lyrics." 13 Voices, the recently released new album from Sum 41 continues to chart and premiered at #9 on the Billboard Top Albums chart. In addition, 13 Voices secured the #5 spot for LP Vinyl Albums, #6 for Alternative Albums, #7 for both Rock Albums and Top Internet, and landed at #22 on the Billboard Top 200. In its first week, the album sold 16,100 copies, an increase from their last album, Screaming Bloody Murder, which featured Grammy nominated song, "Blood in My Eyes." Fans can purchase the album now in stores at Target, on iTunes or streaming on Spotify. The 10-track album was recorded, produced and engineered by singer Deryck Whibley at his home in Los Angeles and marks the band's first LP in five years, following up 2011's Screaming Bloody Murder. These pop punk veterans made their return to Late Night TV with a performance on The Late Show with Stephen Colbert. The band played one of the newest fan-favorites, "Fake My Own Death." Check out the performance here. Sum 41 has been on the road and selling out shows all across the country and Canada. The tour has been full of high energy and in your face performances with support from Senses Fail and As It Is. VIP Packages and general tickets are still on sale in select cities. The full list of cities the Don't Call It A Sum-Back Tour will be hitting can be found below with VIP tickets available here. The band has previously released three new songs and music videos for "Fake My Own Death," "War" and "God Save Us All (Death to POP)." The single and music video, "War," has been spinning at CIMX, Faction, idobi Radio, Alt Nation, Music Choice, KROQ, KFMA, KFRR, KITS, and more! It has been featured on multiple Spotify Playlists, including Pop Punk's Not Dead, Rock This, The Scene, and New Music Friday.